WSPR experiments are tentatively planned to occur between 2300 and 2400 hours UTC on July 30, 31, and Aug 1. Most broadcasts will be at the 80m dial frequency default in WSJT, that is 3.5926 MHz with AM (3 dB loss) because HAARP does not have an upper side band (USB) mode yet! This entry was posted in Ham Radio, News, Shortwave Radio and tagged Chris Fallen (KL3WX), HAARP, Southgate ARC, WSPR on July 28, 2018 by Thomas. In late September, Christopher Fallen and technicians at the High Frequency Active Auroral Research Program (HAARP) near Gakona, Alaska, switched on a giant array of 180 antennas. They were hoping to produce radio-induced airglow, also known as artificial aurora, as a way to better understand the mechanics of natural aurora. He embedded images into the powerful radio wave that HAARP uses to heat a patch of the ionosphere, and alerted amateur radio enthusiasts through Twitter. As the experiment ran, his feed began to light up with tweets from listeners who were sending the images back to him. Fallen, an assistant professor at the University of Alaska Fairbanks’ Geophysical Institute, had transmitted two UAF logos, a cat photo, and a QR code granting the recipient 0.001 Bitcoin. Messages returned from Pueblo, Colo., and Victoria, British Columbia. Given that HAARP’s antennas point directly up at the sky instead of out toward the horizon, Fallen was pleased with the results. 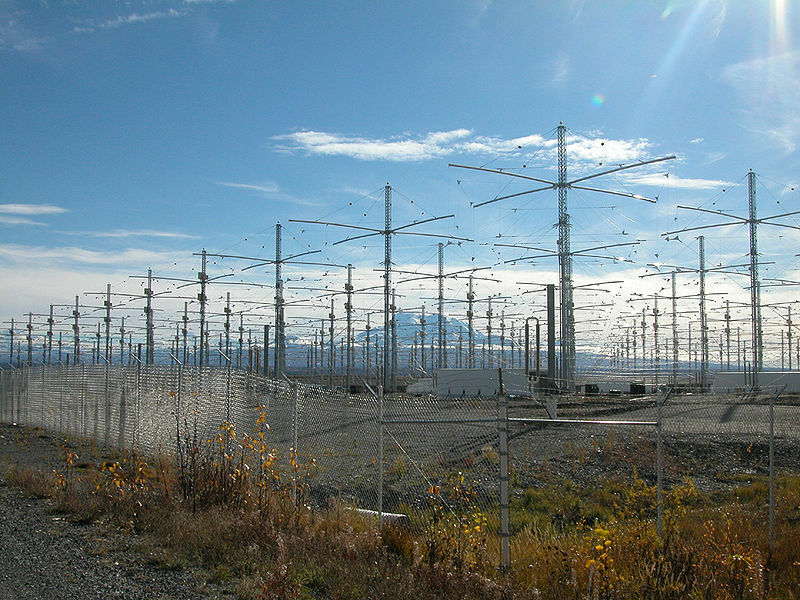 “As powerful as HAARP is, it’s just a big radio,” he says. It’s actually a giant phased array radio transmitter capable of sending 3.6 megawatts of energy into the ionosphere. Click here to read at the Southgate ARC Website. This entry was posted in Ham Radio, News, Shortwave Radio and tagged Chris Fallen (KL3WX), HAARP, High Frequency Active Auroral Research Program, Southgate ARC on October 23, 2017 by Thomas. 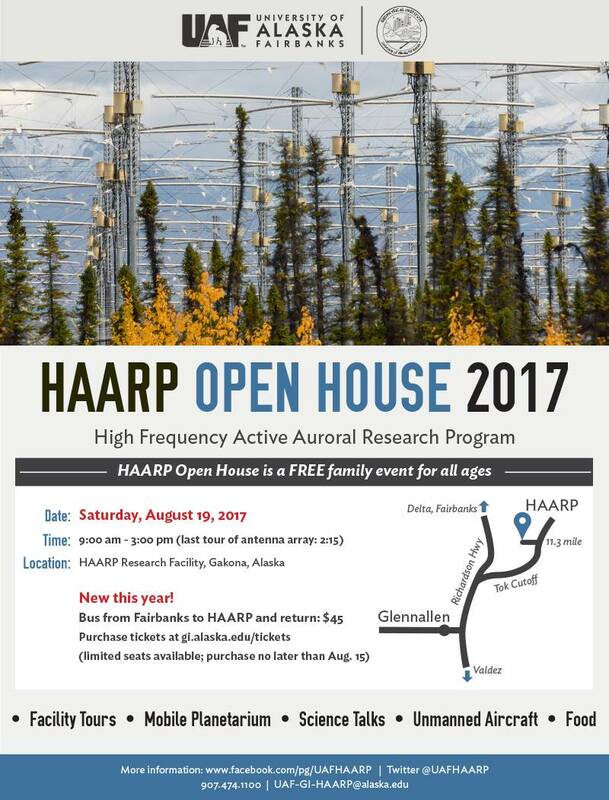 The next HAARP open house will occur on 19 August 2017 and include round-trip bus transportation from Fairbanks for $45 which will help bring costs down for individuals, particularly for those from out of town. Throughout the day there will be talks by Geophysical Institute researchers on-site about the HAARP facility and research, and other research topics pursued at the UAF Geophysical Institute. As in the previous year, tours of the main transmitter array, control center, and power generation plant will be offered throughout the day. Hams and radio enthusiasts are encouraged to bring their equipment for photo opportunities or even to make contacts from the site. Any SWLing Post readers/contributors plan to attend the open house? If so, we’d love to share your photos! Please contact me if interested! This entry was posted in News, Shortwave Radio and tagged Alaska, Chris Fallen (KL3WX), HAARP, HAARP Open House, High Frequency Active Auroral Research Program on July 15, 2017 by Thomas.